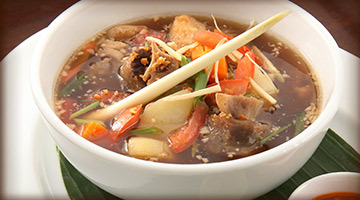 Market Street Cafe Come to Market Street Cafe today and try our oxtail soup. This delectable spin on oxtail soup has been renowned and is a must try for most! Our famous oxtail is stewed for hours in order to soften tender cuts of beef. The softened beef cut is then tossed along with our slowly simmered broth mixed with onions, carrots, peppers, celery, garlic, and chopped tomatoes. The beef falls apart in your mouth with savory flavors lingering with each bite.